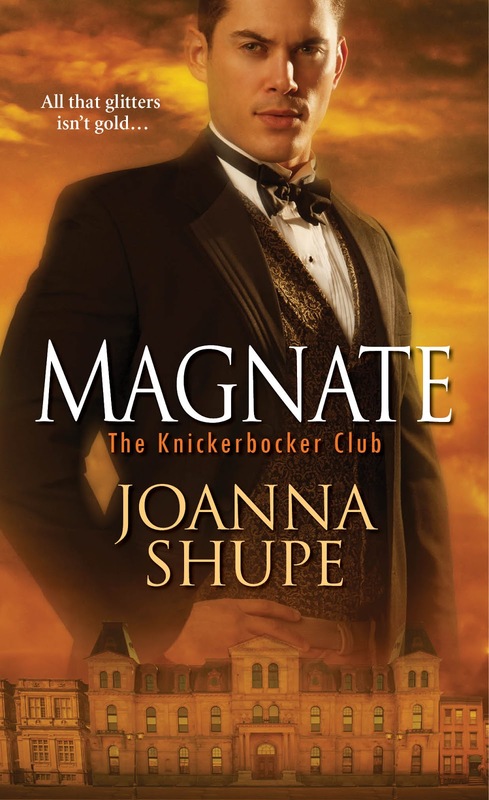 Joanna Shupe introduced her Knickerbocker Club series set in New York City during the Gilded Age with the novella Tycoon, the story of Clara Dobson, a shop girl, and Theodore Harper, president of one of the nation’s largest banks. Clara witnesses a crime and is on the run from the perpetrators. With no money and only the clothes she is wearing, she is headed home to Missouri. Ted is in Grand Central Station about to board his private car for business meetings on the train with a St. Louis brewer. When Clara spots her pursuers, she randomly attaches herself to Ted, unaware of who he is. Ted can’t decide if Clara is crazy, involved in a scam, or actually in danger, but he agrees to let her share his car. She, in turn, agrees to help distract the wife of the brewer while the men discuss business. Clara’s presence proves an unexpected boon. Over the next few days, Clara and Ted come to know each other better. The attraction that sparked with that first kiss between strangers grows exponentially. But trust grows more slowly, and Clara remains in danger. Can love really conquer all? If I were evaluating this as a standalone, I would award it 3.5 stars. I love the characters, and the premise, but the novella format allows for development for both that is too thin for my taste. However, as a teaser for a new series, this novella is highly effective. It certainly captured my attention and left me eager to read the first novel in the series. For this reason, I gave Tycoon five stars. Elizabeth Sloane belongs to elite New York society, old money with connections to the original Dutch settlers and low tolerance for the nouveau riche who were increasing in numbers and in personal wealth in the late nineteenth century. The queen bee of Old New York was Caroline Schermerhorn Astor, creator of the famed “Four Hundred,” a list of socially acceptable upper-class families. Known as Knickerbockers (a term sarcastically coined by author Washington Irving) by outsiders, old New York limited the power of its women to the social scene. It is this rigidly defined role that Elizabeth resists. She wants a life that consists of more than parties, opera, and gossip. An interest in stock trading fostered early in her life through time spent with her father has increased with her awareness that she is intelligent and particularly skilled in picking the right stocks. Growing concerns about the family business headed by her brother William heighten her interest in opening her own brokerage firm and adding to the family coffers. Her brother refuses to entertain the thought of his sister in business. Knowing that she needs to be publicly connected with a man powerful in the business community, Elizabeth approaches Emmett Cavanaugh, hoping that a man who belongs to the city’s new wealth will be less conservative than her brother. Elizabeth erroneously believes that her brother and Cavanaugh are friends because they, along with Theodore Harper (The Tycoon) and Calvin Cabot, owner of three large newspapers, belong to a four-member secret group who use their power and money for purposes that require their joint efforts. Cavanaugh rose from brutal poverty and an early childhood spent in the squalor of the infamous Five Points. Ruthless and driven, from the age of twelve, he devoted himself to ensuring that he and his three siblings escaped the hunger and violence of life in America’s first urban ghetto. He started working in a steel mill, and he ended up owning it and much more. Cavanaugh is first amused and then intrigued by Elizabeth. He consents not to her initial proposal but to a wager with her shares in her family’s company as her stake. He is conscious, as is Elizabeth, of the strong attraction that sizzles between them, but each thinks the social gulf between them cannot be bridged. I have long wished for the return of the non-Western American historical romance, and I am delighted to see more in this subgenre being offered in recent months. I find the Gilded Age a fascinating period. I even briefly considered making Edith Wharton the focus of my dissertation. You can then imagine how pleased I was to learn that Schupe was setting a series in 1880s New York City. My expectations were high, and Schupe met them beautifully. She does a wonderful job of world building, from her descriptions of the opulent homes of the wealthy to the backroom meetings of the powerful who are not overly particular about using ethical means to achieve their goals. Lest some reader complain that Elizabeth’s triumph is unrealistic, Schupe provides an author’s note that briefly recounts her real life model. Elizabeth and Emmett are complex, layered characters who held my interest from the first pages. I found her likeable and sympathetic. Although Emmett is not always likeable, he is always compelling, and, given what readers know of him, he remains true to his character. My one reservation is that I would like to have seen his character explored a bit more fully. The secondary characters add depth to the story. I especially loved Emmett’s family, and I eagerly await Baron, the third novel in the series, which will feature William Sloane, Elizabeth’s brother, and a fake medium. 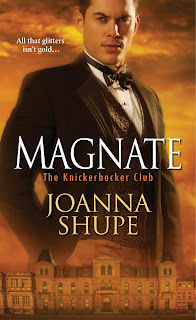 If you are a fan of cross-class romances or the forced marriage trope, if you are captivated by Gilded Age tales, or if you like historical romance that combines the tried and true with the fresh and new, I highly recommend Magnate. I liked it so well that I have pre-ordered Baron (October 25, 2016). It has a political element! I can’t wait! It isn't necessary to have read Tycoon to appreciate Magnate, but the novella is only $.99 for a Kindle copy. It is well worth the price. I read and reviewed both "Tycoon" and "Magnate." I especially loved "Magnate" and am looking forward to "Baron" in November 2016. Another gilded age and romantic historical novel that readers of Magnate may also enjoy is Sara Donati's The Gilded Hour, set in 1883 New York City and featuring strong female characters who are 19th-century physicians with complicated families and cross-cultural and political challenges. It's a lengthy saga but I couldn't put it down and eagerly await its sequel that promises to resolve a few mysteries. Many Outlander fans, while waiting for Gabaldon's next title, were directed toward Donati's Into the Wilderness series.